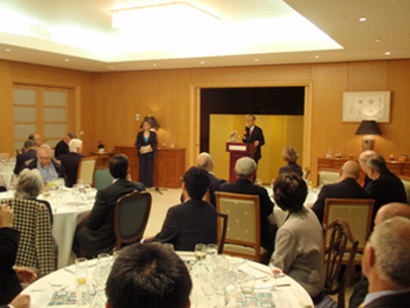 On February 12, Ambassador Sato hosted a reception on the occasion of the visit by Mr. Koji Omi, Founder and Chairman of the Science and Technology in Society (STS) Forum, to promote exchanges in the area of science and technology between Japan and Israel, inviting leading scientists and businessmen of Israel. 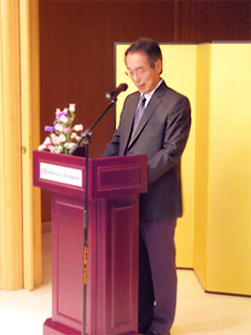 Ambassador Sato pointed out that in order to enhance cooperation in science and technology it would be imperative to enhance interactions between the relevant societies, both academic and business, of the two countries, and that the STS Forum would provide an excellent opportunity to accelerate such cooperation. Prof. Ruth Arnon, President of the Israel Academy of Sciences and Humanities, Prof. Hanoch Gutfreund, President Emiritus of the Hebrew University of Jerusalem, Mr. Elchanan Harel, President and Founder of Harel-Hertz Investments House and Honorary President of the Israel-Japan Friendship Society and Chamber of Commerce, made welcoming and introductory remarks. Mr. Omi briefed on the activities of the STS Forum and expressed his hope for larger participation from Israel in the upcoming 10th Anniversary Annual Meeting this October in Kyoto.